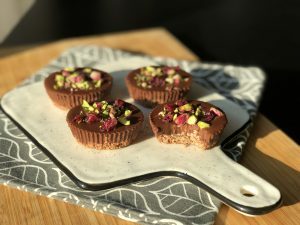 These chocolate tarts are really easy to make, they are no-bake and they are made using muffin pans. They store wonderfully in the freezer, these can be individually wrapped after being frozen, then once you know you have guests coming or you just want a sweet treat, you can defrost as many as you need. You can use any kind of chocolate you prefer, but I do recommend using at least a 50% semisweet, otherwise it just becomes to sweet with a milk or white chocolate. Add the coconut oil to a small saucepan, let it melt completely then add in your finely chopped chocolate, stir until melted. Line 18 slots of the muffin/cupcake pans with paper cupcake liners. Add your coconut oil-chocolate mixture to your cookie crumbs in a medium bowl along with the salt, mix with a spatula until they are thoroughly combined. Evenly distribute your cookie mixture in the cupcake liners (I usually use about 2 1/2 tbsp in each). Use the bottom a small jar that will fit inside of the cavity of your cupcake pan to firmly press the cookie mixture inside. Chill in freezer for at least 30 minutes before making the ganache. In a small saucepan heat the coconut milk, bring to a simmer on medium-high heat. Meanwhile make the espresso and have your chocolate finely chopped and ready in a medium bowl. Once your milk has come to a simmer, pour it over the chocolate and add the espresso and coconut oil as well, let it sit for 1 minute without stirring. Then add the salt and gently stir until smooth, be as slow and gentle as much as possible to avoid adding air bubbles. Remove your cupcake pans from the freezer. Pour your ganache inside each cavity, try to first fill up each one with an even amount, then if you have leftover ganache, evenly top them all off. Chill them in the fridge for 10-15 minutes, then top them off with some chopped nuts and dried fruit. Freeze for at least 1 1/2 hours or until solid. After they have frozen completely, peel off the paper liners and place the tarts in the fridge, allow them to chill for another hour before eating. The reason why we freeze them first is to be able to cleanly remove the paper. You can store the tarts in an airtight container in the fridge for up to 3 days or keep them frozen for up to 1 month and allow for them to defrost in the fridge for 2-3 hours before eating.